Cashback by redemption means we pay you back your discount in equal instalments (not all in one go) at set points throughout your contract. Automatic cashback means we will automatically process your cheque for you. Please allow 38 working days for your cheque to arrive. How do I claim my cashback by redemption? The first thing you need to know is which months' bills you need to submit. You can find this information by logging into My Account, and viewing the 'My Cashback' section. Once you know which months to claim, you'll need to submit the correct network bill for each cashback installment. There are two ways to submit a claim. The easiest way is to upload your bill online, through My Account. If you choose this option, please make sure it's uploaded in one of the following formats: JPG, BMP, PNG or PDF. Please retain proof of postage for reference. Regardless of whether you choose to submit online or by post, you'll need to submit each claim within 60 days of the bill date. Each claim needs to show specific information in order for the submission to be successful. 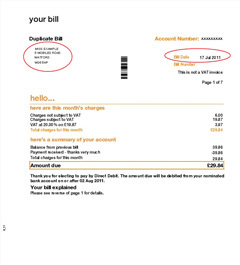 Please check below to see how your bill should look. Q: I'm still waiting for my redemption cheque, how long should I wait? A: Please allow 28 working days for you to receive your cashback cheque. Q: I sent my claim in, but I haven't heard anything from you, what do I do now? A: It can take up to 14 days for your claim to be processed. You are able to track your claim via the My Account section and selecting My Claim Status. Q: Can I submit a bill online? A: Yes - You can submit your bills to us online by visiting your My Account section. You should then click on the 'My Cashback' tab and follow the instructions. Q: Can I submit an online version of my bill? A: Yes - You can submit an online version of your bill to us by visiting your My Account Section. You should then click on the 'My Cashback' tab and follow the instructions. Your online bill must display your name, address, mobile number, tariff and the bill date. A: To find out which bills to send go to the My Claim Status in the My Account section of the website. Q: How long do I have to send in my claim? A: When your claim is due you will be able to see a CLAIM NOW option in the My Claim Status section of My Account . You will then receive an email from us to let you know we’ve received you claim. Q: Can I send a photocopy of my network bill? A: No - You can either send your original bill via post or submit an online version via My Account. For more information on submitting your bills, please log in to the My Account section. Q: What information does the bill need to show? A: All bills sent in must show your name, address, the date of the bill, the tariff, current balance and your mobile number. Q: I have more than one claim to make, do I send them altogether? A: No - you will need to claim separately for each account you have with us by using the order numbers on your order confirmation emails. Q: What if I want the cheque made payable to someone else? A: The terms of our cashback offers are that we will only issue the cheque in the name of the person who took out the phone contract. We're therefore unable to make payments to anyone else. Q: What happens if I change my address or mobile number after the sale? A: Once your address or mobile number has been changed, you need to visit the My Account section and select the 'My Personal Details' tab to update your details. If you send in your bill to claim and the address and/or mobile number do not match those on our records, your claim will be rejected. Q: What is automatic cashback? A: Automatic cashback means you do not need to claim with us, we will automatically process your cheque for you. Please allow 38 working days for your cheque to arrive. If posting in your bills these must be sent by recorded delivery as we cannot be held responsible for lost items or claims that arrive outside of the qualifying period stated above. The submitted bill must include all of the following information: Your name, your address, your mobile phone number, your current tariff and the date of the bill. We cannot accept signed-for deliveries on weekends so please bear this in mind if sending us your claim by post. We can only accept one claim per envelope or upload. Multiple claims in one envelope or upload will result in the claim being rejected. It is the customers responsibility to chase their claim if they have not received their cashback cheque. If your network provider increases your line rental inline with inflation, the cashback that you claim will still be worked out and paid using the line rental you signed up to. 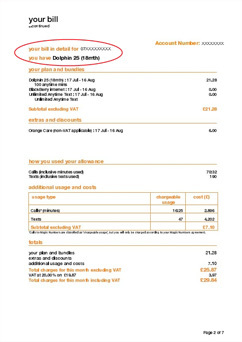 For example, if you took out a £36 per month contract with your network and they increased the line rental to £36.56 per month half way through, you will still only receive cashabck worked out for £36 per month. You do not complete the minimum term (12, 18 or 24 months) of your contract. If your account is not up to date with payments. If the network bills sent are not for the same account and in the same name as the one eligible for the cashback. If your claim is received more than 60 days from the date stated on the network bill you are required to submit. If your contract has been disconnected (including disconnections made under Lifeline insurance). If the incorrect monthly bill is received. late or non-payment of bills, any cashback claim will be null and void.